The candidate should have passed the qualifying examination with a minimum of 40% marks in the concerned subject. For the courses where the admission is based on the degree as a whole, the aggregate percentage in the group subjects should be 40% of marks. For admission into M.Ed., the aggregate marks in B.Ed. should be 50%. For admission into M.Sc. Tech in Hydrogeology, the aggregate marks in M.Sc. should be 50%. Pass is sufficient for SC/ST candidates. 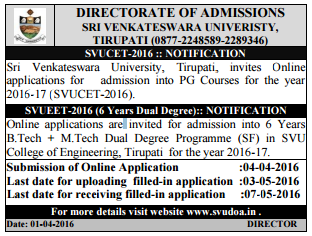 Candidates who qualify themselves in the SVUCET-2016, but do not have the requisite percentage of marks in the qualifying examination or not satisfying the subject eligibility requirement are not eligible for admission. Candidates who pass the qualifying examinations in September / October supplementary examinations of 2016 are not eligible for admission during the academic year 2016-2017.